What is included with home packages? This question is one of the most popular ones we get during daily interaction with our customers. We offer a very complete package right from the start, so the answer to that question gets quite lengthy. 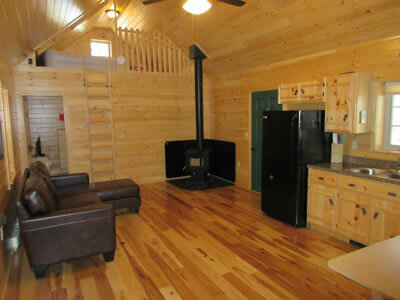 This includes things like: complete exterior with log siding (protected with exterior sealer), double-pane insulated vinyl windows with shutters, insulated walls and ceilings, knotty pine interior with polyurethane finish, yellow pine solid wood floors, full electrical system including panel box, breakers, lights & ceiling fans, bathroom fixtures (even toilet paper & towel holders), solid pine kitchen cabinetry with dovetailed soft-close drawers, etc., etc. 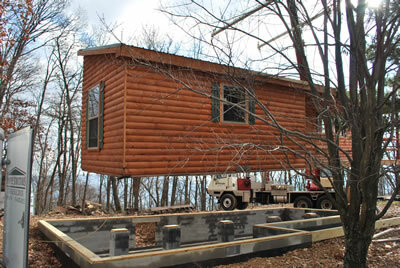 Even the shipping costs (within 50 miles of Bedford, PA location), crane rental, setup costs, and taxes are all included! 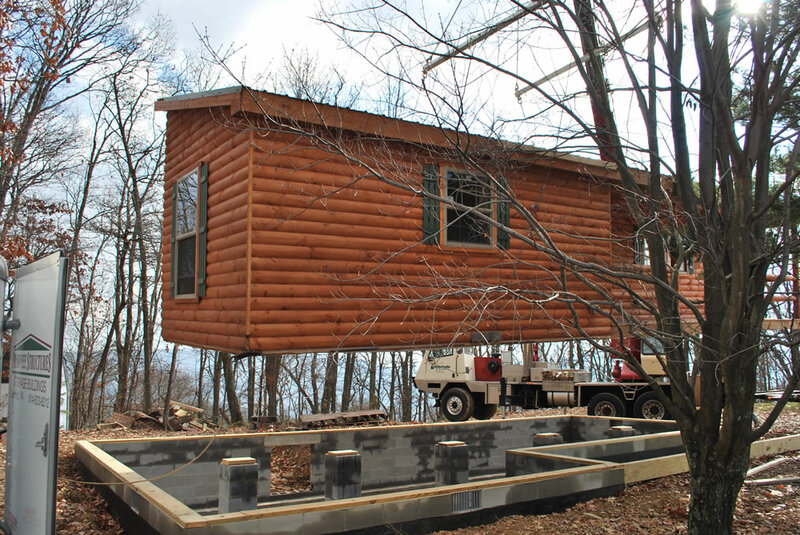 How much does a foundation cost for log cabin? 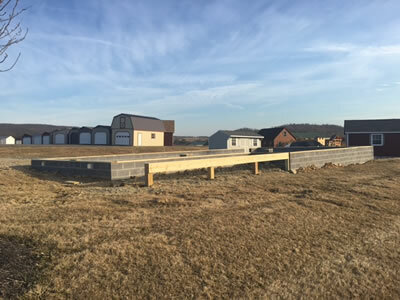 Foundations, driveways, and site work are not included in package price. 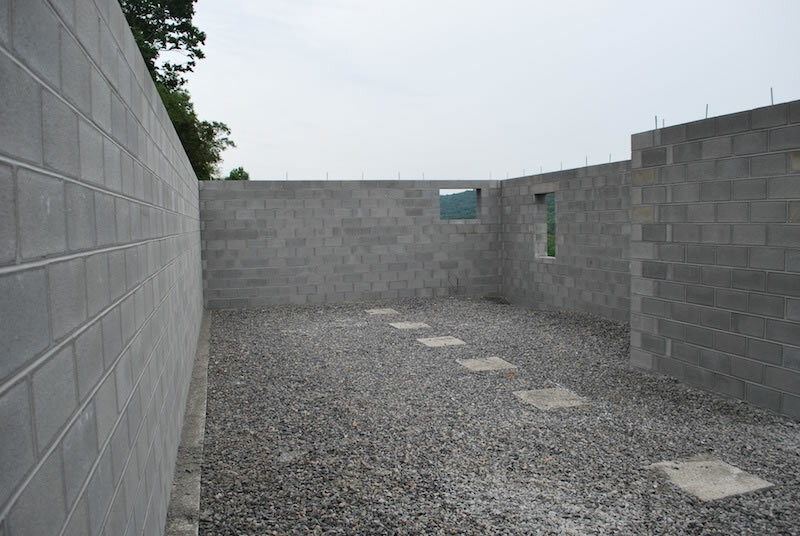 A full basement with concrete floor generally runs around $10,000 to $20,000. Piers are required for lolly column post. Exact spacing depends on floor plan. Steel beams can be installed to reduce the amount of lolly columns required. A crawl space typically runs about $5,000 to $10,000. What are sill plate requirements? Sill plates are considered part of the foundation. 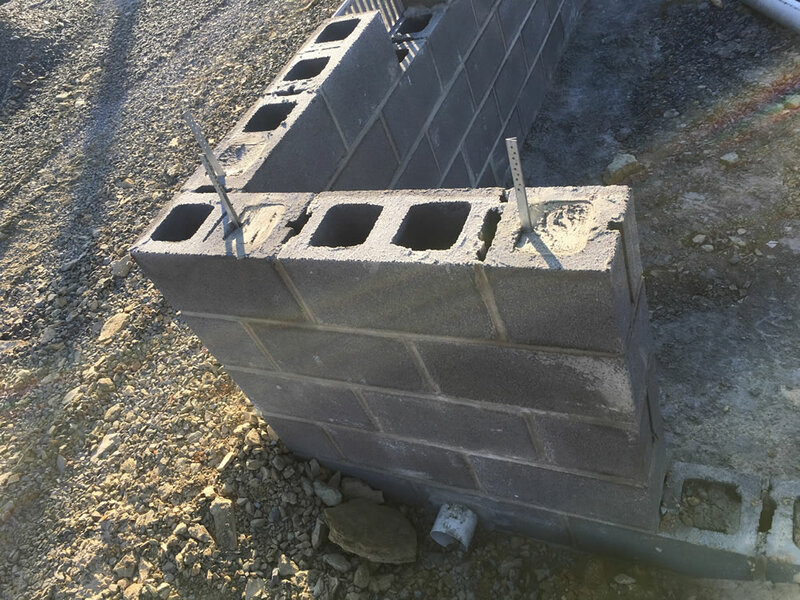 Sill plates should be fastened with mudsill anchor straps. Anchor straps are preferred as they are flush and do not hinder setting of cabin. A Simpson MAB23 or similar mudsill anchor is recommended approximately every 4' . See you tube video on mudsill anchor. Can customer choose light or fan fixtures? Light and fan fixtures can be deleted from package if you want fixtures other than standard light and fan fixtures. Are appliances included in home price? What is onsite plumbers responsibility? The plumbing is complete inside the cabin, but you need to make the final connections. If your cabin is on a crawl space foundation or basement all the water lines and drains will be stubbed through the house floor below each fixture. After the cabin is in place your plumber will connect all these locations below the floor and connect them to your well and septic. What is onsite electrician's responsibility? 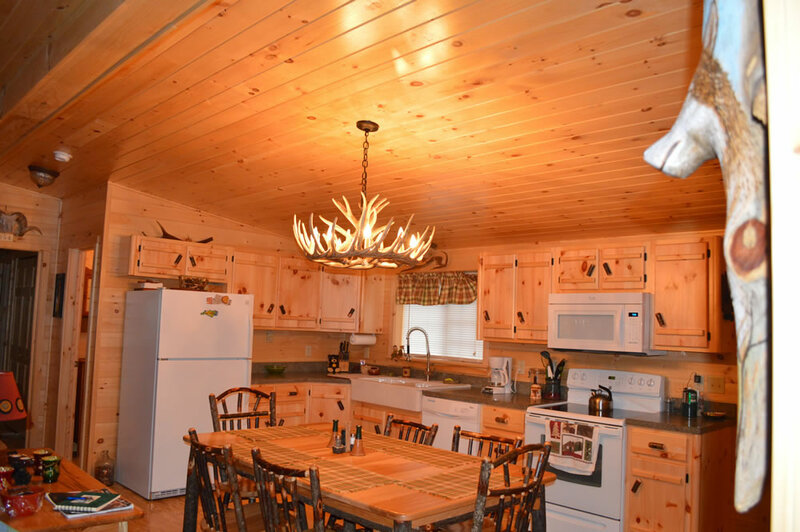 The electrical panel box and wiring on cabin is installed and inspected during construction of log home. Onsite electrician is responsible to provide main feed from electric company to pane box. If you are putting your cabin on a basement, we can temporarily tuck the panel box up under the floor and swing it down onto your basement wall when the cabin is set. Are interior basement steps included in home price? Interior steps are included on plans that are standard with interior basement steps. Plans can be modified to include basement steps or deleted from plans that include basement steps. Are Exterior steps to porch included in home price? Exterior steps vary greatly depending on finial grade. Discuss porch steps with sales rep to get a quote for your project. 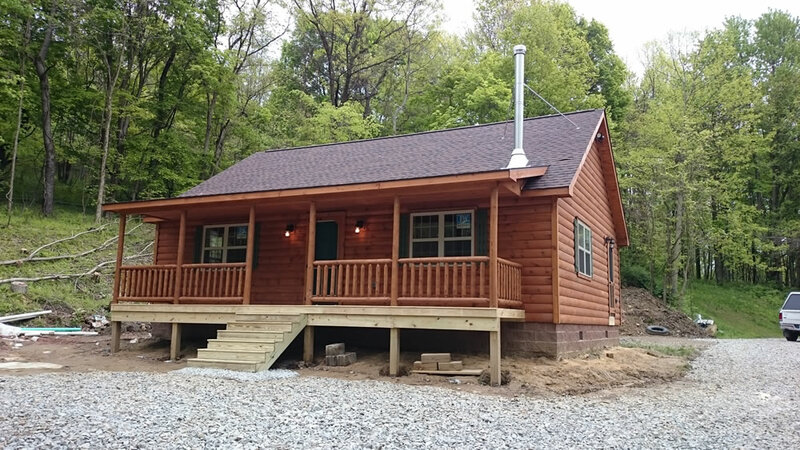 Are rain gutters included in cost of Log Home? 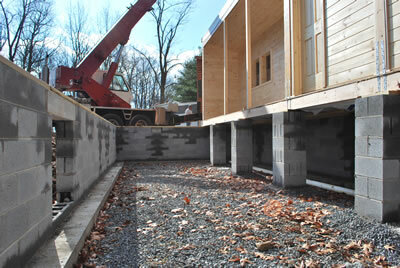 Rain gutters are installed onsite after home is mostly complete. Rain gutters and downspout are responsibility of customer. 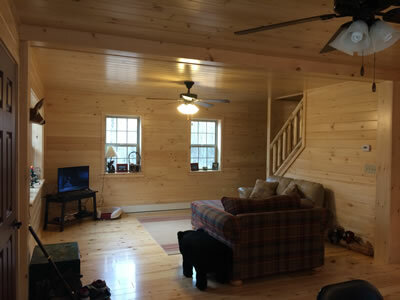 Is subfloor insulation for basement included with cost of home? Basement subfloor insulation is typically installed after onsite electrician and plumber completer their work. Home price includes onsite installation of subfloor insulation. We can deduct $1.50 per square foot if customer decides to take responsibility for subfloor insulation. What is standard heat source? Our standard package includes baseboard heat. Virtually any traditional heating system (including central heat & A/C or radiant floor heat) can be installed by a local contractor. ($1.50 per square foot credit for no baseboard heat) We can also provide and install insulated chimney for wood stoves or fireplaces. 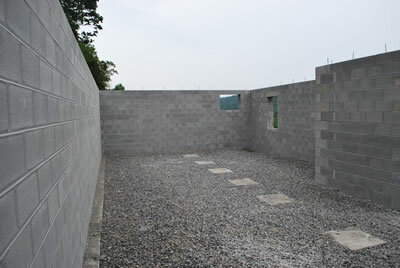 Certified homes require an approved heat source. 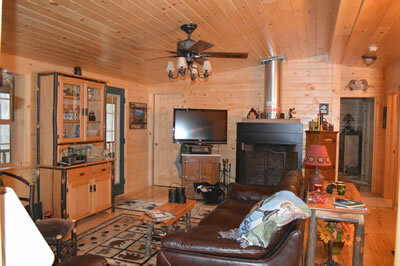 Wood stoves can be secondary heat source but not primary heat source. Insulated chimney on 8/12 Pitch Roof. 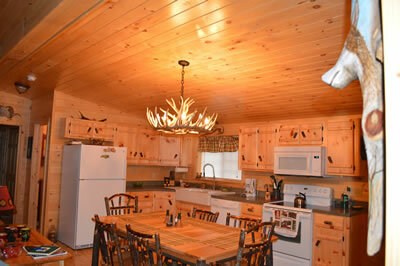 Shawnee Structures does not have any direct financing available for log homes. Local banks are often a good source for home construction loans. Can Shawnee Structures be the general contractor? Most home construction loans require one company to be responsible for all funds distributed from home construction loan. 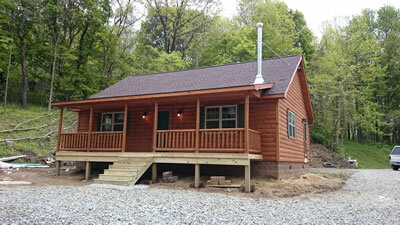 Shawnee Structures can be general contractor for projects within 50 miles of our Bedford location. See a sales rep for details.